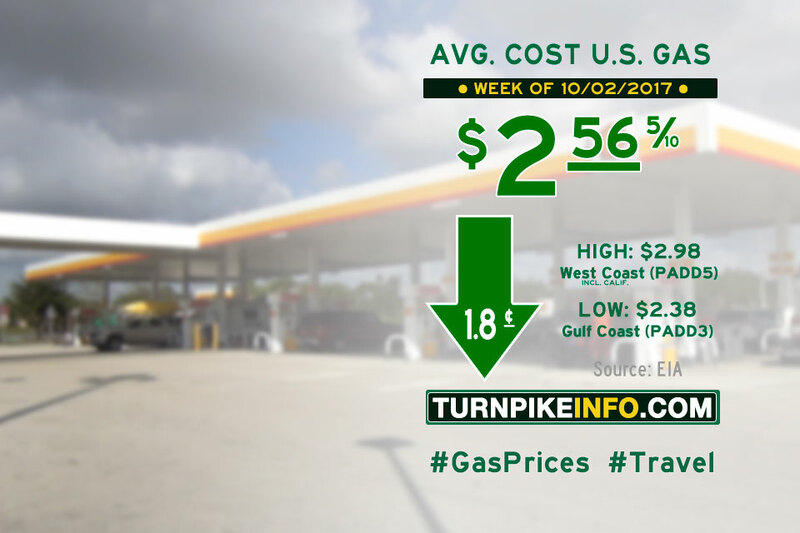 Fort Lauderdale, FL – Gas prices, which soared in the aftermath of Hurricanes Harvey and, to a much lesser extent, Irma, are continuing to come down, though not at the same pace they increased in late summer. For this week, at least, the price of gas on a nationwide basis fell nearly two cents, according to the latest nationwide price survey released by the U.S. Energy Information Administration. The national average now stands at $2.57 per gallon, according to the E.I.A. Prices fell in all regions this week, except for the Midwest, where prices went up about four cents per gallon. In other regions, declines were varied, from as little as about two cents across the Rockies to nearly six cents in the Lower Atlantic states, including Florida and Georgia, which had to contend with Irma. Prices across the Gulf region returned to their status as lowest in the nation this week, according to the E.I.A. The region had ceded the distinction of cheapest gas to the Midwest during the past two weeks. Diesel prices remained flat or increased slightly this week, the survey report reads. The average cost of diesel went up about a half penny per gallon, but due to rounding, the national average remained flat at $2.79. Regional cost averages for both gasoline and diesel are listed below, showing the current week and previous week. Prices are ranked from highest to lowest price.